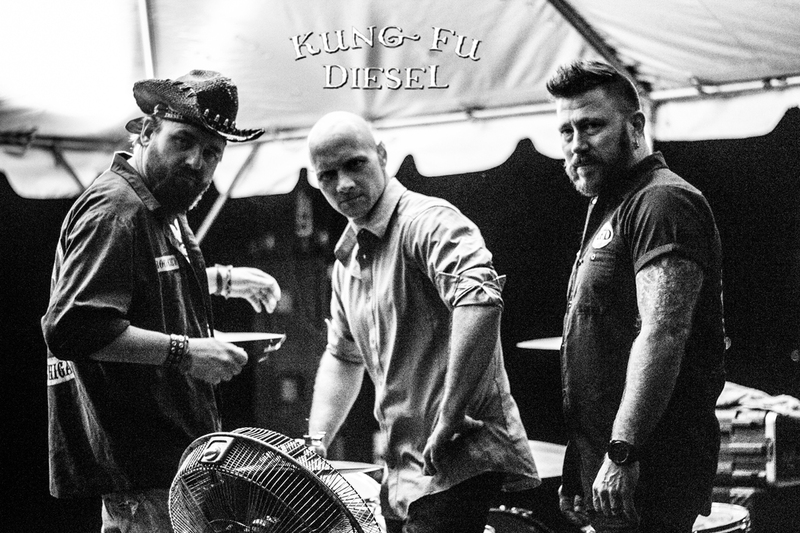 Kung Fu Diesel is 3 piece, 3 chord American Rock & Roll band born out of the swamps of Jackson, MI USA. These 3 childhood friends grew up, formed a band, and moved to New Orleans to get a music education by playing on any stage that would let them. The time they spent on the bayou allowed them to get some value stage time and develop a unique sound. Using their influences of Rock & Roll, Outlaw Country, Punk, and R&B they began writing songs. partydogs who don’t puke. Kung Fu Diesel are my sonic bombastic BloodBrothers. These guys are authentic.” Quite an Endorsement. Over the past 15 years, Kung Fu Diesel has remained unsigned, but have released 4 CDs and sold over 25,000 copies of them. They have also opened shows for some of the biggest names in country and rock. These bands include: Foreigner, 10,000 Maniacs, Ted Nugent, Jackyl, The Pretenders, B52s, Ratt, Nazereth, Charlie Daniels, Martina, McBride, Lynyrd Skynyrd, and Weird Al Yankovich to name a few. Always know as a great live act with great songs, this band is still going strong and looking to expand it’s fan base to Europe and beyond.